By keeping track with the market development, we are offering optimum quality Pin Bush Coupling that is precisely designed in tune with quality standards. Our provided coupling can assist in absorbing shock loads due to high acceleration, deceleration or change of direction. Our offered product is manufactured by skilled professionals who have desired experience & complete knowledge about product. 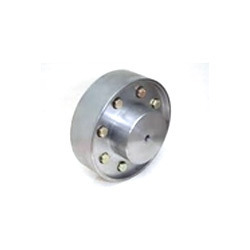 Provided couplings are widely used in the electric motors, machines, pumps & automobile industries. Incorporated in the year 1993, at Ahmedabad (Gujarat, India), we, “Mangalbhai & Brothers”, are engaged in Manufacturing, Exporting and Supplying of Extruder Screen, Bevel Gear, Wire Mesh & Wire Mesh Cloth, Perforated Sheet, Hopper Magnet, Candle Filter, Industrial Chain, Metal & Plastic Bucket, Timing Pulley, Elevator Bucket and many more. This range of products are made using premium grade raw material and innovative techniques in compliance with the industry laid norms and standards. Developed by skilled engineers & technicians, our products cater to the demands of industries like heavy duty and mechanical. For checking the quality of our products, we have developed inbuilt inspection unit. Bestowed with the features like sturdy construction, precision engineering, superior quality, reliable performance, efficient output and high durability, our offered products have gained huge appreciation by clients. These products are widely used in industrial as well as for residential applications.